Wow, what an amazing weekend. We took a small 4-day trip up to beautiful Mendocino (thanks Dad). Our first vacation in about a year-and-a-half. It was beautiful. We don't have many pictures to show for it--we were too busy taking it all in!! It's a charming village, one of three historically designated towns in California. We stayed in "the shed" at the Seagull Inn right in the middle of town. The proprietors were nice. Everything is walk-able. The skyline of the town is punctuated by rustic water towers and windmills. Event though Deanna was still a bit sick with the flu, we managed a short drive up to Fort Bragg on Sunday. 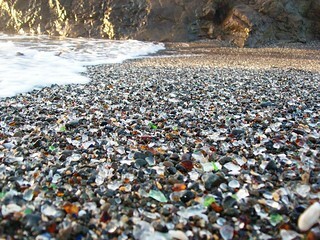 Instead of sand, the beaches are covered with mounds of sea glass. It was there at Glass Beach that Kevin dropped down on one knee and proposed to Deanna.